In many family reunions in the Philippines members of these families usually have souvenir programs and t-shirts prepared for everyone. And on most of these programs and shirts colorful illustrations of family shields, called coat-of-arms, are used as decorations. The question is: it is okay to use coats-of-arms? An important auxiliary to genealogy is Heraldry, which is the practice of designing, displaying, describing, and recording coats of arms and badges. Historically, coats-of-arms were used to distinguish the armies of one knight against another. Later on, these colorful banners were incorporated into family decorations and when these were already common practice, state authorities started regulating the use of arms. Technically, a coat-of-arms is granted to a person, and not a family. The use of arms is also legally passed only to the eldest child. If other children wish to use it, the arms should be “differenced”, or designed somewhat differently from the original. This early on, it must be understood that the only way for one to legally bear a coat-of-arms is first to prove descent from the original grantee of the arms. When a woman inherits the right to use the arms, and gets married to another arms bearer (or armiger, as the technical term goes), the coats-of-arms of the man and woman have to be combined, or “marshalled”. 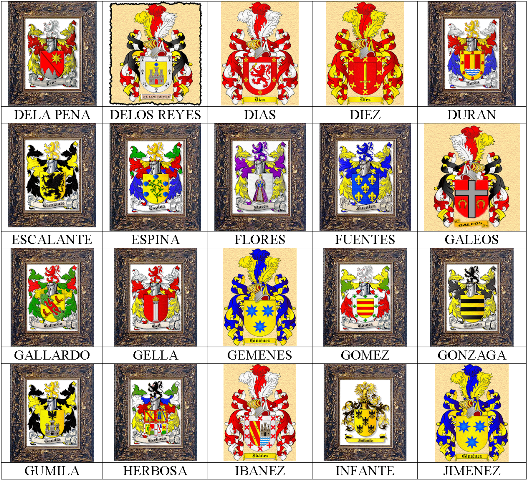 There are many other colorful terms used in general heraldry. Through it’s almost 900 years of history, heraldic terms have developed into colorful and interesting proportions. But the laws governing the use of arms today are not as strict as it was in the past. In the middle ages, when someone was caught using an arms that was not granted to any of his or her direct ancestor, imprisonment was the usual punishment. Today, families who carry the same surname as that of an armigerous family indiscriminately use these arms. Such practice is common especially in countries like the Philippines and the United States where there are no governing bodies regulating the use of arms. 3. Our grandfather was Spanish so that automatically means we have a legal right to bear these arms. Again, we have to remember that because of Governor-General Claveria's 1849 decree many Filipinos have Spanish-sounding surnames. So having a Spanish last name in the Philippines does not necessarily mean one's ancestor was Hispanic. Reprinting an official coat-of-arms from one of the Spanish research centers or archives does not mean one has the legal right to use this as a family emblem. And certainly, having a Spanish grandfather or even a great-great-grandfather even with archival documentation does not mean that this ancestor was granted the right to bear arms. This becomes especially true when an ancestor carried a very common last name, like GARCIA, CRUZ, PEREZ, etc. Although having a coat-of-arms is nice, one has to prove first that his family is directly descended from an original bearer of an arms. Otherwise, a family can only use these arms as decoration but these have no legal purpose. I have created a coat of arms for my family because historically, we don't have one. This is just for some artistic representation and for decoration purposes. I hope I'm just doing fine. Sorry to be prying, but would I be able to see the one you done. Im looking to make a signet ring for my father and create my own coat of arms as far as I'm aware, we don't have one. 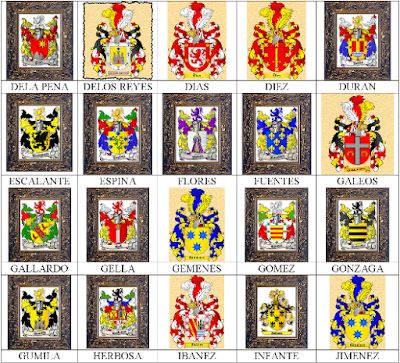 This is well written - yes, there are some descendents of Spanish settlers who might have inherited a coat of arms, like those at https://philippinearmorial.org/2017/10/13/coats-of-arms-of-spanish-settlers-in-the-philippines/. Most Filipinos instead have the opportunity to create new coats of arms - please see our Design guidance at https://philippinearmorial.org/2017/02/05/featured-content-2/. Thank you. I am actually planning to write a longer version of tbis article in my upcoming genealogy book. 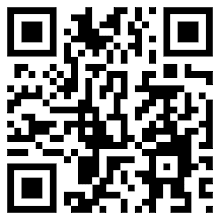 I will include your organization in the writeup. Thanks! Thank you Sir Todd. We would be grateful if you have a look at our site philippinearmorial.org and let us know if you have any feedback or resources to share. We are especially interested in compiling coats of arms that are legitimately borne by Filipinos for our permanent online record, so that we can promote the proper use of coats of arms. Thank you again!